2018's Progressive Poem is HERE today! Howdy, Campers ~ And yikes! The Progressive Poem is HERE today! 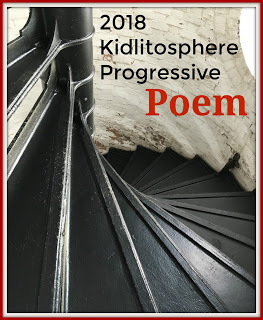 The Kidlitosphere Progressive Poem began in 2012 as a way to celebrate National Poetry Month (April) as a community of writers. Here's a three-way conversation between this poetry game's originator Irene Latham, Heidi Mordhorst, and Liz Steinglass just before 2018's poem sprouted. This year, 30 poets signed on. Our mission: to grow the poem, one line at a time. A few days ago, I posted a poem about my mixed-up feelings leading up to this momentous day. ...aka, the day I add a line. This year, our instructions were: "take a minute to record your first impressions of how the [first] line strikes your imagination and what you think the poem might become." 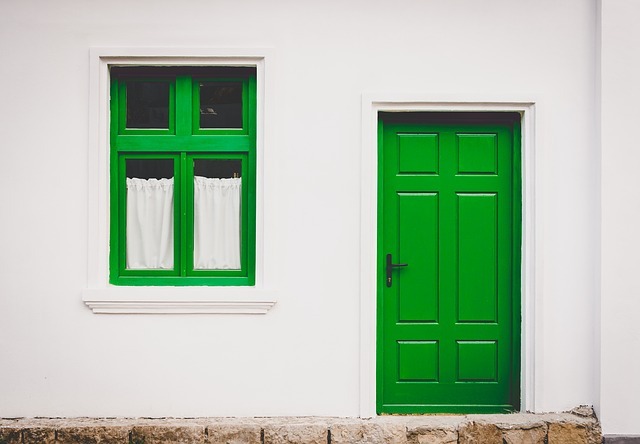 So...I read the first line, by Liz Steinglass: Nestled in her cozy bed, a seed stretched. s-t-r-e-t-c-h-e-d to the max. Will she be a vine who crawls along the tops of walls? A tree who ages with each generation? And my, my, look how our small seed has grown! I loved Jan's line #5: invented a game. It grounded me; I couldn't wait to learn the rules of the game which Jasmine, Owl and Moon would play. And then...off we veered! As Matt wrote: "the seed has invented a game, but she’s not playing it – which is a conundrum as far as a narrative goes." And as Heidi wrote:"you poets, you really know how to turn a ship with a well-chosen word!" I liked Donna's prethinking of possibly including a sound, a texture, a smell...or perhaps, why be serious? Donna jokingly toyed with the idea "that Jasmine slipped out of the owl's talons and fell to the ground and the owl ate her, The End..."
My notes. 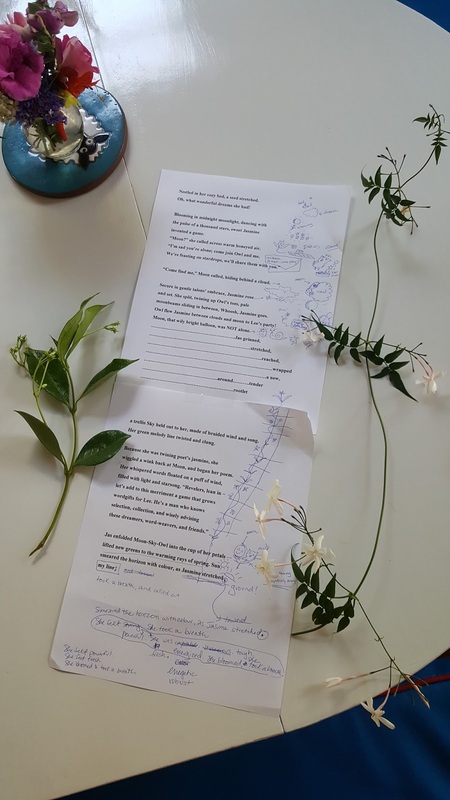 Star jasmine on the left, poet's jasmine on the right. And boy, is its aroma intoxicating! Along the way, Christie discovered that poet's jasmine is a real plant (which curls up the posts of our home--but I didn't know it was poet's jasmine! Thank you, for this, Christie!) According to one website, "give [this plant] heavy support [e.g., a trellis, etc.]." Isn't that what our warm community of poets and readers does? Another site says, "this jasmine grows quickly and has a strong resilient root system." And that was my way in. I thought about what a young person could take away from our poem, especially in light of the fast-growing, newly awakened, resilient power of this generation. The Progressive Poem is a kind of poet's relay race isn't it? who takes us to the finish line! 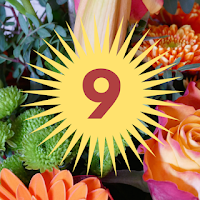 Progressive Poem for Progressive Poets--and our 9th Blogiversary! 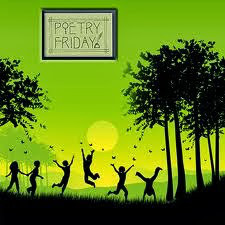 Happy National Poetry Month and Poetry Friday! 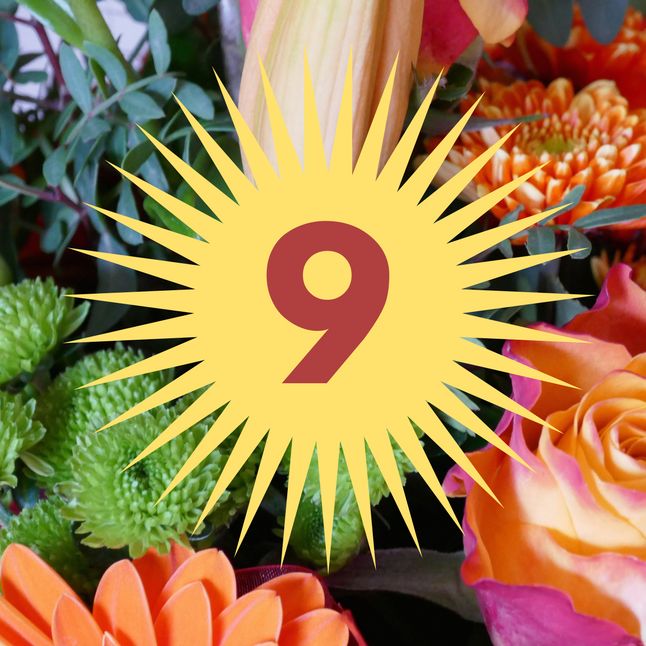 And Happy-Amazingness that we're celebrating TeachingAuthors' 9th Blogiversary--wowza! ...it's been life-changing in many ways. Thank you for starting it, thank you for captaining our ship." 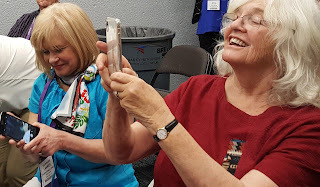 Read Carmela's blogiversary post which includes JoAnn's terrific, short spring poem...then join in our combined Blogiversary/Earth Day celebration by passing along a book that helped you grow in your craft, or that was a favorite read aloud, or that you'd simply like to share with someone else. I'm supposed to contribute, I'm pregnant to post. I'm due to distribute, I'll be Sunday's host. no, don't think ahead—you'll for sure be misled. Poem (c)2018 April Halprin Wayland. All rights reserved. My line is due on Sunday. Wish me luck. 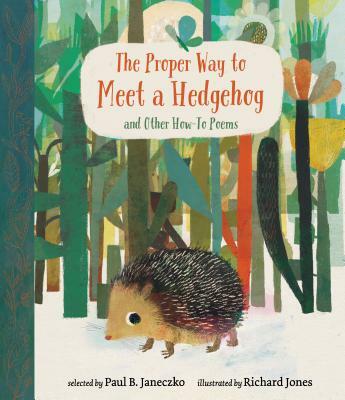 Be sure and visit Jama's Round-up of Events in the Kidlitosphere for National Poetry Month! PS: Before you go, share in the comments if you have a book you're planning to pass along in honor of our Blogiversary/Earth Day celebration! After reflecting on this milestone, I'll share a lovely spring poem from former TeachingAuthor JoAnn Early Macken. In some ways, it feels like it was only last week that Esther Hershenhorn and I met to brainstorm ideas for a group blog. But, strangely enough, it also feels like we've been blogging here forever, especially when I think about how the children's publishing industry has changed in the last nine years. 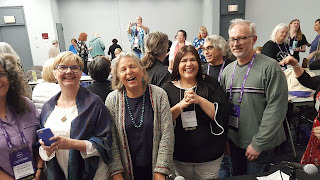 For those of you who are relatively new to our blog, I'm pleased to report that four of the current six TeachingAuthors have been here since we founded this site back in 2009: April Halprin Wayland, Esther Hershenhorn, Mary Ann Rodman, and me (Carmela Martino). 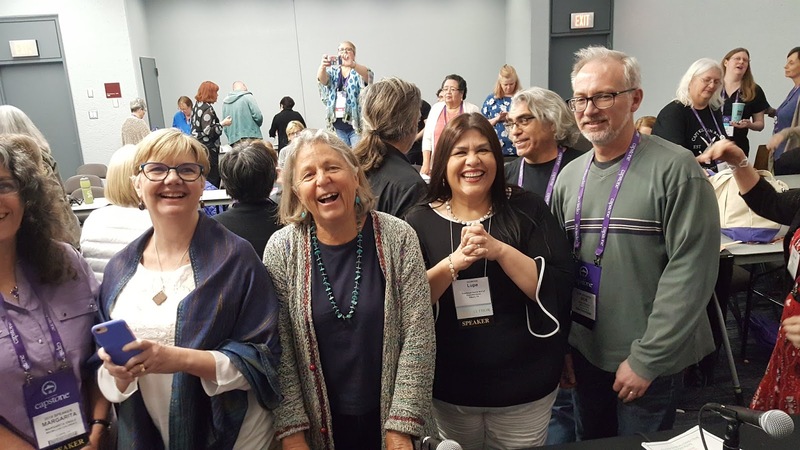 You can see the four of us, plus former TeachingAuthor JoAnn Early Macken, in the photo below, taken when we presented together at a conference some years ago. From left to right: Mary Ann Rodman, Esther Hershenhorn, JoAnn Early Macken, Carmela Martino, and April Halprin Wayland. 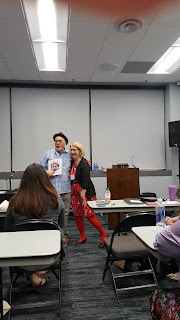 While I miss JoAnn and the other TeachingAuthors who have left the team, I'm thrilled to have Bobbi Miller and Carla Killough McClafferty with us now to add their unique perspectives to our topics. If you'd like to read more about our current and past TeachingAuthors, check out the About Us page. Also, I encourage those of you who teach or have aspiring young writers at home to visit our recently updated Young Writers page, which includes links to tips specifically for young writers and sites where they can get their work published. If you have any sites we should add to the list, please let us know in the comments. Just as our TeachingAuthors team has changed over the years, so has our posting schedule. We originally blogged three days a week, on Mondays, Wednesdays, and Fridays. A few years ago, we cut back to Mondays and Fridays only, with an occasional Wednesday Writing Workout. As we begin our tenth year, we've decided to drop our Monday posts. Beginning today, we'll blog regularly on Fridays only, with occasional Wednesday Writing Workouts and other special posts. We have two main reasons for the change: 1) We fear that with the rise of social media, our readers are having trouble keeping up with all the information being shared online. [I know I am!] And 2) We'd like to have more time for our own writing and teaching. We hope you, our readers, won't be too disappointed by this change in our schedule. We'd love to have your feedback on it in the comments. In honor of our Blogiversary, I've been doing some virtual spring cleaning here on our site, removing obsolete links, updating information, etc. I've also been spring cleaning my home office. 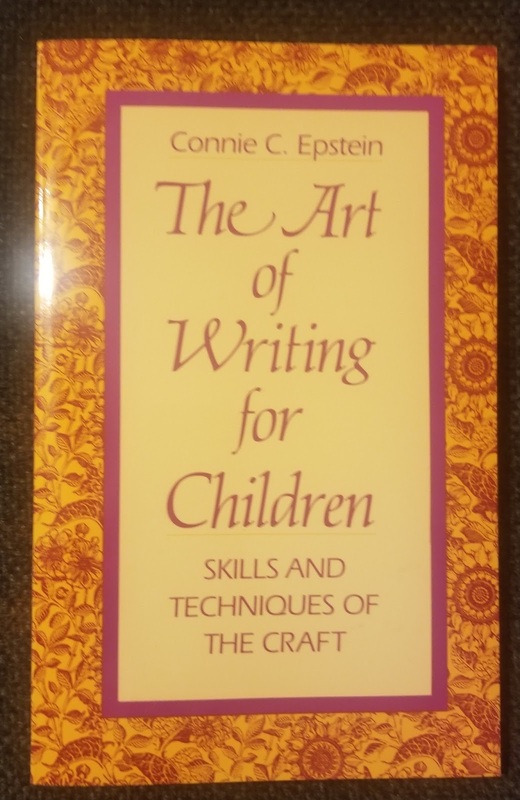 One of the things I discovered was that I have a second, never-used copy of Connie Epstein's classic book The Art of Writing for Children. This is one of my all-time favorite books on the craft of writing for children and teens--I still quote from it in some of my classes. 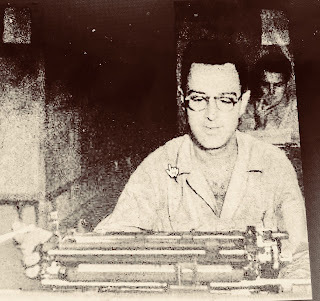 While the info in the section on "Finding and Working with a Publisher" may have changed greatly over the years, the basic instruction on the craft of writing, which composes the majority of the book, still applies. So, rather than put the book in the paper recycling, I plan to bring it to the next writers' meeting I attend and offer it to anyone there who may be interested. Seems appropriate, since our Blogiversary happens to fall on Earth Day! 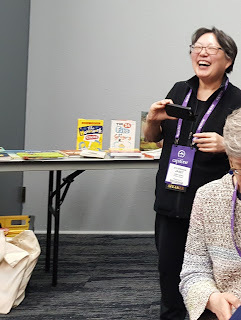 When I told my fellow TeachingAuthors about the book, Esther suggested that I invite you, our readers, to join in our combined Blogiversary/Earth Day celebration by passing along a book that helped you grow in your craft, or that was a favorite read aloud, or that you'd simply like to share with someone else. Despite all this spring cleaning, it hasn't felt much like spring around here--lots of cold, gray days and even some snow in the Chicago area. And it's been even worse in other parts of the country. I hope that by sharing the following poem written by JoAnn Early Macken, I'll be able to coax some spring construction around here. Thank you, JoAnn! Daffodils bulldoze last year’s leaves. Chickadees haul twigs and straw. they’re building a brand-new spring! Don't forget to check out this week's Poetry Friday roundup over at The Opposite of Indifference. Before you go, though, do share in the comments if you have a book you're planning to pass along in honor of our Blogiversary/Earth Day celebration! I’m working on choosing final images that will go in my book Buried Lives: The Enslaved People of George Washington’s Mount Vernon. Images are critical for a nonfiction book like this. 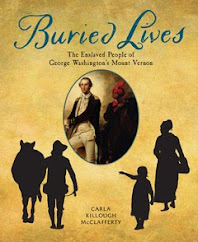 One part of the book includes a chapter about the archaeological dig that is taking place in the Slave Cemetery at Mount Vernon. I want to include photos of volunteers working there and there are some great images to choose from. But each photo needs to meet a list of factors for it to work for the book. This is a photo of me working the sifter during the dig. While it does fit the text of the book it is more important to use images of other volunteers. I took this photo, but it isn't the right choice to be in the book. Other images are better and will carry more weight. Is it needed? Photos take up a lot of real estate in a book, so each image must carry it’s weight and be worth the space. It must compliment the text. The photo needs to either add a deeper understanding to what I’ve written or give a platform to use more information in the caption to get across information that didn’t fit within the text. It matters what is in the background of the pic. Does what is behind or beside the subject add to the photo? Or can it be cropped? Is the photo hi res enough for publication? Some images must be deleted because they aren’t good enough for print. THIS FOLLOWING PART IS ABSOLUTELY CRITICAL! And finally for me at least, I want to make sure I have permission from the people who are in the photos (if they are recognizable). I’m working on this part right now. While the photos I want to use technically belong to Mount Vernon, the people in the photos are volunteers. So I want each one of them to tell me it is acceptable for me to use the photo in my book. To ask for permission, I’ve got to communicate with them. Sometimes that is harder than it sounds. At times I’ve had to be a real bloodhound to find people. It is all part of the research. Just this morning I sent out another round of emails seeking permission from people in the pics I want to use. I hope to hear from them very soon because the book is with the book designer now. If I don’t hear from them giving me permission, the pic won’t be in the book. Got to go now—maybe the people I’m looking for sent me an email . . . I hope so. My turn to weigh in on National Poetry Month. Topic: novels in verse. I'm fascinated with this way of storytelling, and have been trying to write one myself for longer than I care to reveal. I don't get regular poetry (especially the rhyming kind). Maybe it was the dismal poetry I was "exposed" to in school. Two weeks of Longfellow...we ALWAYS had two weeks of Longfellow. You spend two weeks reading Evangeline and see if you don't want to pull your hair out. Mostly, I learned to slink down in my seat whenever we had a "poetry unit." Fast forward 20 years. 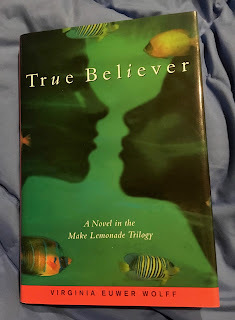 I was a university librarian when I discovered my first verse novel, Make Lemonade by Virginia Euwer Wolff. Wow! 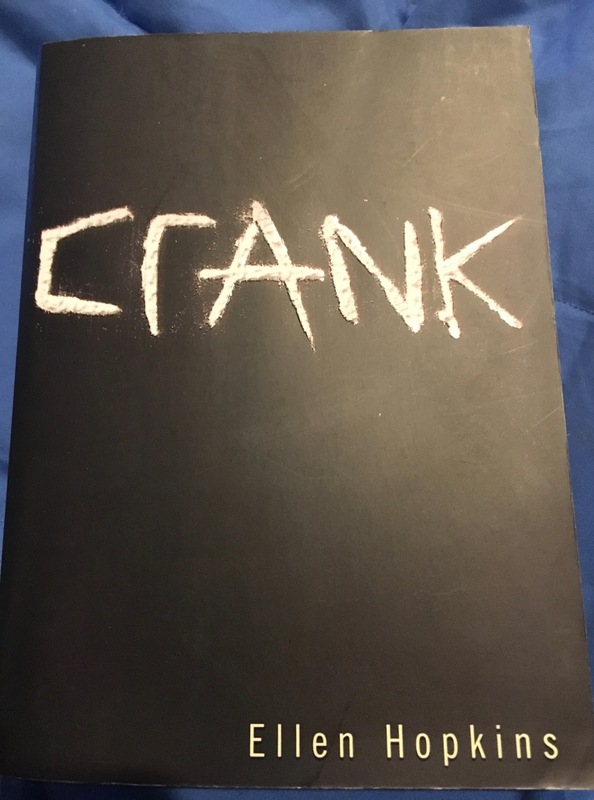 A story told in free verse...so free that you are never sure of the personal details of the main character, LaVaughn, and her friend, Jolly. What they look like, where they live. Wolff leaves the reader to fill in those details for himself. Each poem like a chapter. A one or two page chapter. What a concept!! This was a literary whack on the side of the head. Of course, I reasoned, this was just a quirky concept. No one else would ever write such an outrageous book. Of course I was wrong. 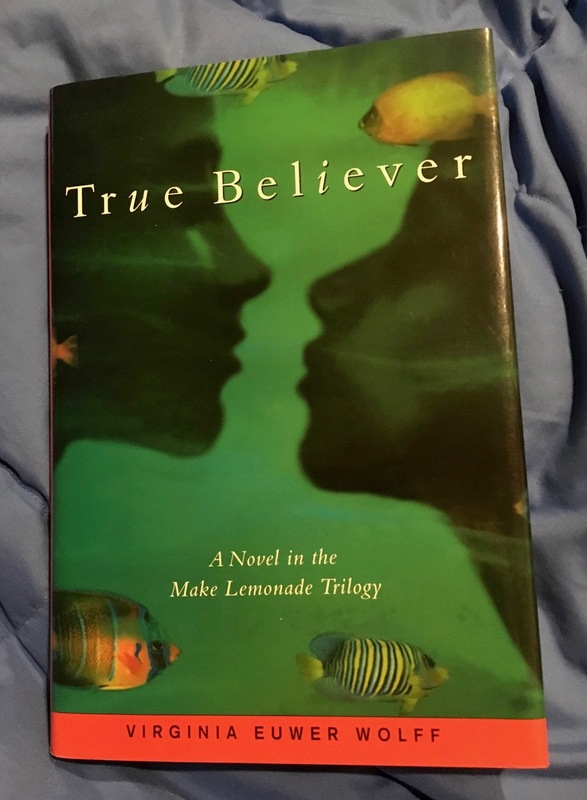 Wolff 's sequel, True Believer, won the National Book Award and was a Printz Honor book. Fast forward, and it's 1998. The next verse novel that caught my attention was Out of the Dust by Karen Hesse, that year's Newbery winner. Not only a Newbery winner, but also winner of the Scott O'Dell Award for best historical fiction. This is in My Top 10 of Books Published in the Last 20 years. 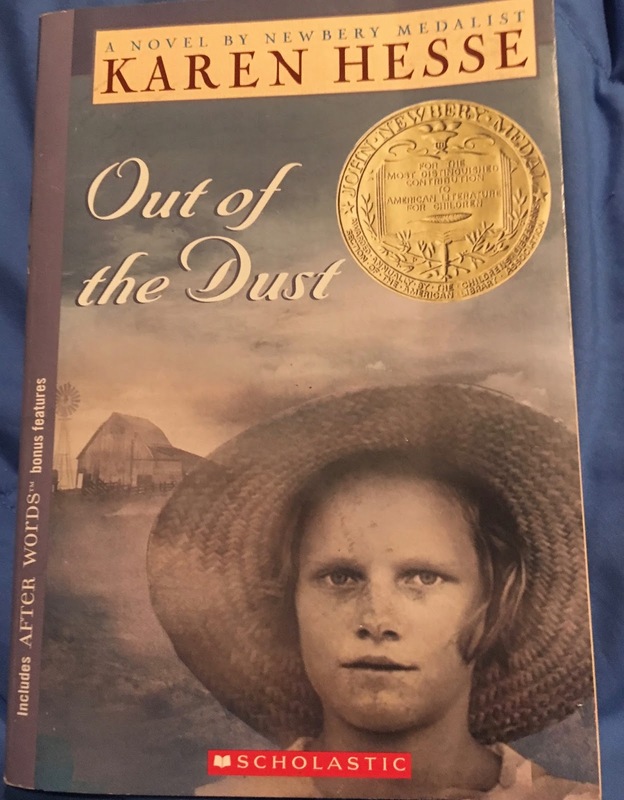 It has everything I look for in a book--a girl standing up to hard times (in this case, the American Depression--one of my favorite historical periods) An absent parent, and one who is emotionally absent. A struggle for a dream. All in free verse. I know some people don't share my love of this book. Well, we all have our opinions and now you know mine. So why am I hooked on novels in verse? Certainly not because they are easy to write. They're not. The book may be 300 pages, but with this style of writing and page lay out, the actual word count is ridiculously low. As with picture books, every word must count. 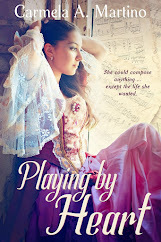 The writing is vivid, tight, and packs an emotional punch with the fewest words possible. It's a real writing challenge. Trust me; I know! It is an easy read for the student, without the student being aware of how easy it is. They see a 300 page book, and think Nope. I don't like to read. I don't have time. I'm not a good reader. (Pick one.) Then they open the book and see all that lovely white space, a relatively small amount of words. (Nothing says I don't want to read this than large blocks of description.) Since each page or two is a complete episode, if not an entire chapter, the reader can put down the book without fear of losing track of the narrative when he picks it up again. I have heard verse novel detractors dismiss the form as "just creatively arranging sentences on a page." If that is all there is to a book, just rearranging sentence breaks, or turning each page into a shape poem (which would be exhausting to write and read)I would agree. But I've never read a bad verse novel, and I've read every thing published in this genre for the last 20 years. You have to be a darn good writer to pull it off. A number of writers (Ellen Hopkins comes to mind) were primarily poets before attempting a verse novel. The years I've spent writing and revising and ultimately rejecting my own verse novel have not been in vain. 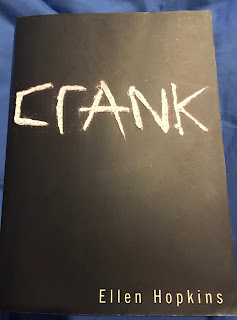 In the X number of years I've had this project in my computer (and head) I've honed my sense of what makes these books work. To contemplate why my book should be a verse novel. I have concluded that the subject is so intense that it bogs down in regular prose. I tried to write it that way for two years before I made the big leap to verse. Once I started, I knew this is the only way the story would make sense. to me. I have this season's verse novels--Blood Water Paint by Joy McCullough, The Poet X by Elizabeth Acevedo, Forget Me Not by Ellie Terry (this came out last year)--all cued up and ready to read on my Kindle. Perhaps one of them will have the key, the clue, the Golden Ticket that will help me finish my own book. Now go read a verse novel! Congratulations, Buffy S. and thank you to all who entered out giveaway. Watch this space for our next giveaway. As we celebrate National Poetry Month, we also celebrate its luminaries, and none shines brighter than Lee Bennett Hopkins. 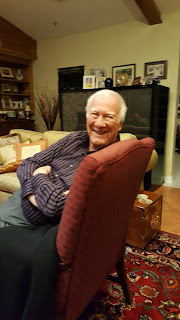 If ever there was royalty in poetry, then surely the crowned Prince of Poetry would be the irrepressible Lee Bennett Hopkins. 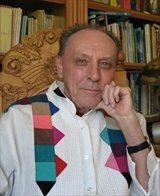 Educator, poet, author, and anthologist, he has written and edited over 100 books for children.Once a senior consultant to Bank Street College's Learning Resource Center, and a curriculum specialist for Scholastic Magazines, Inc, Lee has written and edited numerous award-winning books for children and young adults, professional texts and curriculum materials. He has taught elementary school and served as a consultant to school systems throughout the country. In 1989, Lee received the University of Southern Mississippi Medallion for “outstanding contributions to the field of children’s literature” in recognition of his work; 2009 brought him the National Council of Teachers of English (NCTE) Excellence in Poetry for Children, in recognition of his body of work. In 2010 he received the Florida Libraries’ Lifetime Achievement Award. In 2016, Hopkins received the prestigious Regina Medal award sponsored by the Catholic Library Association. Lee founded several poetry awards, including the Lee Bennett Hopkins Award for Poetry in 1993 in cooperation with Pennsylvania Center for the Book. to fill an empty stage. 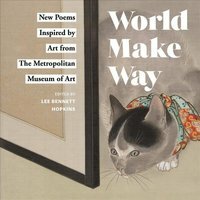 Lee has an amazing new collection out this very month: World Make Way: New Poems Inspired by Art from The Metropolitan Museum of Art. Of all his anthology collections, this is – in my opinion – his most stunning, inspired by the Leonardo Da Vinci quote, "Painting is poetry that is seen rather than felt, and poetry is painting that is felt rather than seen." 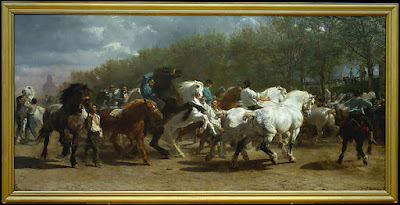 One of the more dramatic poems comes from Cynthia Cotten, inspired by Rosa Bonheur's oil painting, The Horse Fair. The Horse Fair, Rosa Bonheur (French, Bordeaux 1822–1899 Thomery). Public Domain. POETRY STICKS TO YOUR CLOTHES and PHOTOS OF POETS! And yes, it's National Poetry Month! 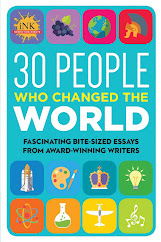 But first...midnight tonight is the deadline to enter our book giveaway for a chance to win 30 PEOPLE WHO CHANGED THE WORLD (Seagrass, 2018). Check out Carla Killough McClafferty’s March 26 interview with the book’s editor Jean Reynolds, then scroll down from the interview to enter our TeachingAuthors drawing. Esther started off our celebration of National Poetry Month; now it's my turn. I'm at the Texas Library Association's Annual Conference, #TLA18, having a fabulous time at the Poetry Rodeo created and sponsored by Pomelo Books. 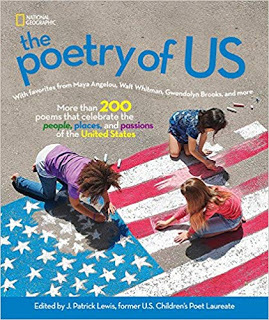 Truly P-o-e-t H-e-a-v-e-n.
Poets included: KathiAppelt, Jorge Argueta, Brod Bagert, Carmen T. Bernier-Grand, Jen Bryant, Shirley Smith Duke, Margarita Engle, Nancy Bo Flood, David L. Harrison, Juan Felipe Herrera, EricOde, Guadalupe Garcia McCall, Ann Whitford Paul, Greg Pincus, BobRaczka, Laura Shovan, Elizabeth Steinglass, Holly Thompson, Sylvia Vardell, April Halprin Wayland and Janet Wong. Wow, right? me, ready for the conference! my apologies to the rest of my poet friends whose photos were too blurry to share! Poetry Month inspired me to begin writing a poem a day in 2010...and I've never looked back. Maybe it will inspire you to write a poem each day, too. Gary came home last night and I was frantic because I like to write my poem before he comes home. At least THAT. So he came home and I asked him if he had any ideas for a poem, for something that sticks...and as I said it, I got an image of the things that stick to my clothes on a hike and I was off and running. Sometimes God is good to me. Shake It Up! It’s National Poetry Month!